These bearings use sliding motion and a thin film of oil to provide theoretically infinite life. 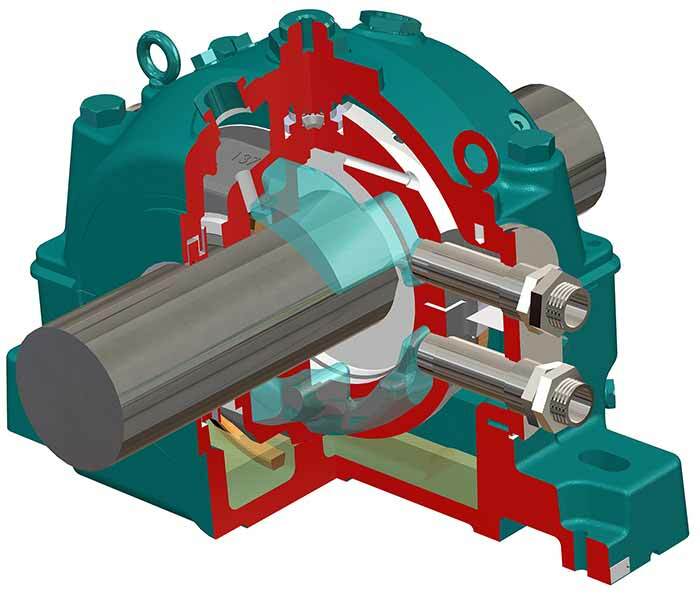 Bearings are key components of industrial fans, and bearing selection is a critical aspect of the overall design. Fan manufacturers often choose to use hydrodynamic journal bearings in large fans, especially when the applications are in extreme environments. These fans are found in many industries, such as refineries, pulp and paper, cement and power generation. Most facilities have two types of fans: forced draft (FD) fans that handle ambient air, and induced draft (ID) fans, which handle hot process gasses. 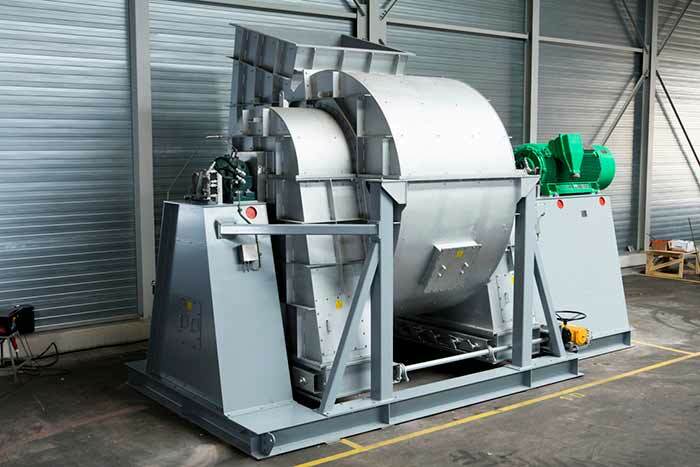 Recently, a fan manufacturer was commissioned to build three sets of large fans for a refinery in Southeast Asia. Each set consisted of one FD fan and one ID fan capable of handling gasses over 350 C (662 F). They were going to be placed outside and needed to run continuously in tropical conditions. As with many applications, these fans were going to be critical to production, so reliability was of utmost importance. Due to the severe environmental conditions of the application, water-cooled hydrodynamic journal bearings with circulating oil lubrication were selected. One of the FD fans is shown in Image 1. This article will discuss the bearings selected for this application and their benefits. Unlike rolling element bearings, which use balls or rollers to separate the bearing inner and outer races, hydrodynamic bearings use sliding motion between the shaft and the bearing surface. There is clearance between the shaft and bearing, and when the shaft turns, a thin film of oil forms between the two surfaces, completely separating the shaft and the bearing. This provides theoretical infinite life, given that the quality and the quantity of the lubricant is maintained. 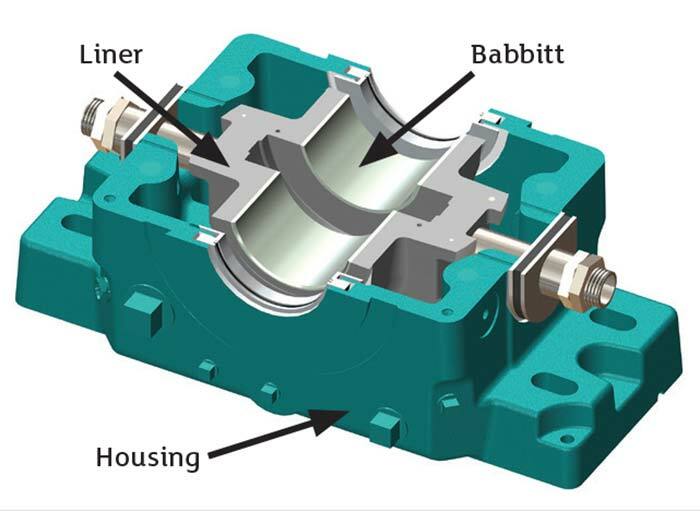 The two main components within a hydrodynamic bearing are the housing and the liner, which contains the babbitted bearing surface. Both components may be made from steel or cast iron. The bearings selected for this application use heavy-duty cast iron for both the housings and the liners for maximum rigidity and damping. Image 3. Oil film modeled as a spring-mass-damper system. K values represent stiffness and C values represent damping. These bearings have many other design benefits as well. 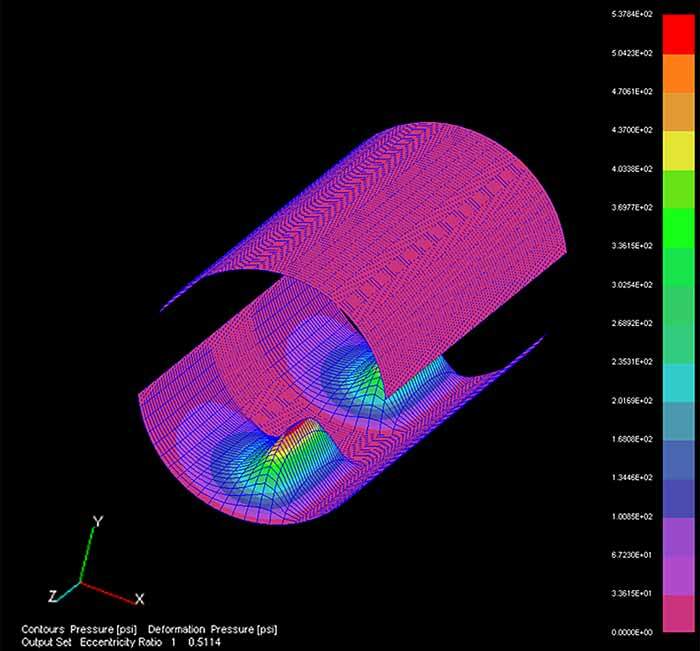 Unlike rolling element bearings, all hydrodynamic bearings provide damping as well as stiffness, which brings significant rotordynamic benefits and greatly reduces overall vibration. According to the Jeffcott Rotor model, the oil film separating the bearing and the shaft behave like a spring-mass-damper system, similar to the shocks and springs in an automobile, shown in Image 3.1 This allows properly tuned equipment with hydrodynamic bearings to perform at low vibration levels, even in the presence of minor rotor unbalance. Image 4. Pressure profile showing the bearing behaving as two short bearings. One factor that affects the stiffness and damping performance of journal bearings is the ratio of the bearing length to the diameter. Longer bearings (L/D ratio greater than 2.0) have higher load capacities, but reduced stiffness and damping ability. Likewise, shorter bearings (L/D ratio less than or equal to 1.0) have higher stiffness and damping, but lower load capacity.2 The bearings selected for this application were designed to find a balance between the two. The total L/D ratio is 1.5. However, these bearings have a large cavity in the middle to accommodate a thrust collar. 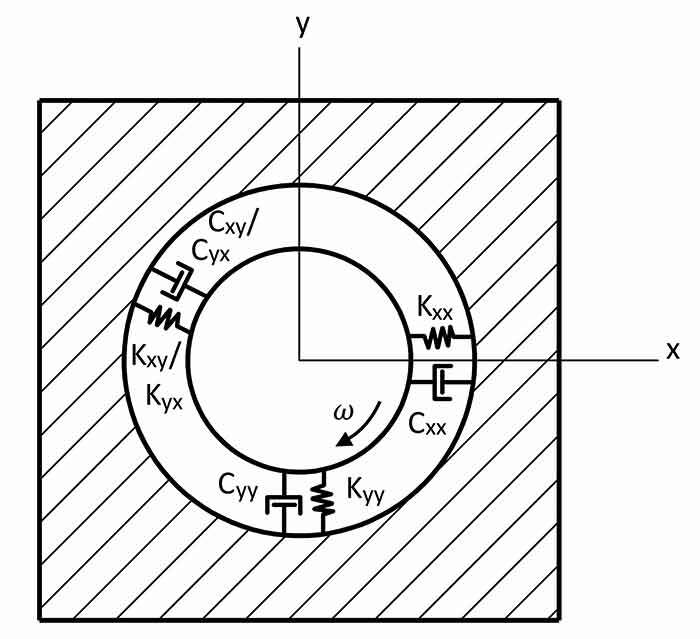 From a rotordynamic perspective, this causes each bearing to behave as two bearings with an L/D ratio of 0.75, shown in Image 4. This allows the bearings to have both high load capacity, stiffness and damping ability. The oil film generated by these bearings during operation is created by a combination of load, shaft surface speed and oil viscosity. In order to generate a film thick enough to lift the shaft off the bearing surface, a significant amount of heat is generated. Image 5. Water flowing through the water jacket in the bearing liner. This heat often needs to be removed to prevent the bearings from overheating. The bearings in this application were supplied with both water cooling and circulating oil lubrication. There are several water-cooled bearings on the market that use a small submerged water tube to cool the sump oil, but the bearings used in this application are designed with a water jacket cast into the liner, which allows water to flow directly behind the babbitt in both the radial load area and behind the axial thrust plates as shown in Image 5.